Available now through June 30 on qualified models. Details below. This could be the difference between finishing a field... or not. Matt Pence talks about his experience with the FST990 Fuel & Service Trailer from Thunder Creek Equipment - including the benefits of faster fueling times and easy transportation around the farm. He relies on his Thunder Creek trailer daily during planting and harvest seasons and says it saves 30 minutes each day compared to his old homemade fuel trailer. 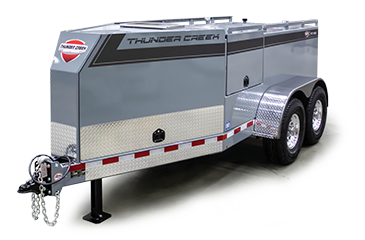 Eligible purchases include new 750- or 990-gallon FST Series Trailer (models: FST750 or FST990) minimally equipped with a 40 GPM Gas Powered Pump, Aluminum Wheels and the 100 gallon DEF delivery system. Purchase must be made from a Thunder Creek Equipment dealer between 4/1/2019 and 6/30/2019. • The toughest, most towable trailers on the market. • Closed DEF systems remain ISO compliant for life.